Faroese social media is exploding with commentary about Sea Shepherd’s Grindstop 2014 anti-whaling campaign. The Faroe Islands is being invaded this summer by The Sea Shepherd Conversation Society, which is coming with more than 500 volunteers in an attempt to stop the Grindadráp, or Faroese whale hunt, by “monitoring the 23 grind bays, deterring the dolphins from shore, and taking direct action to intervene against a grind if necessary.” Operation Grindstop 2014 will be the largest land- and sea-based campaign in the organization’s history. The Grindadráp and Sea Shepherd are both controversial in their own way. The Faroese have hunted pilot whales for hundreds of years, and their meat and blubber formed an invaluable part of their diet in the past, when food was scarce in this remote part of the world. Even today, whale meat and blubber is the Faroese national dish, and the hunt is considered one of the cornerstones of Faroese culture. The main threat to the consumption of pilot whale, as the Faroese see it, are the health effects of the high mercury content in whale meat today. 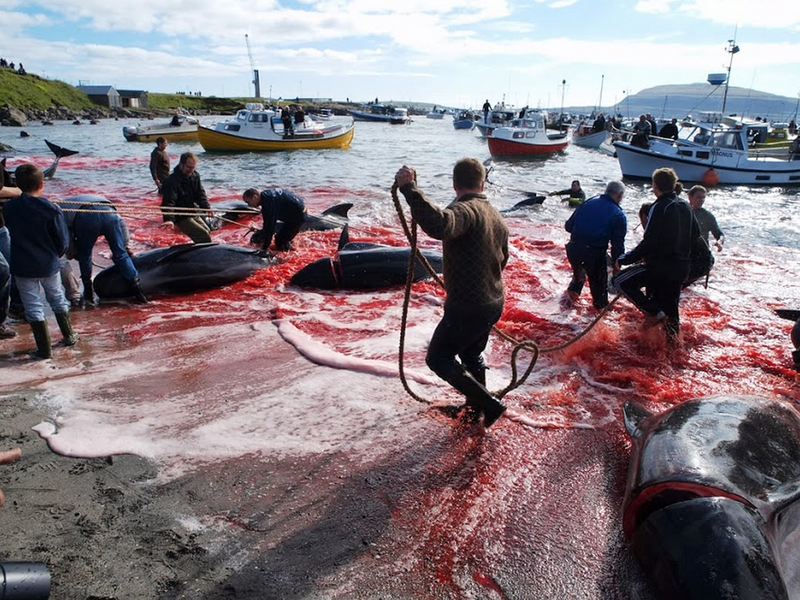 While some argue that the tradition is outdated and unnecessarily cruel, especially since it involves the killing of such intelligent or otherwise special animals, many Faroese argue that killing whales for food in the grindadráp is as humane, if not more so, than the slaughter of factory-raised animals, which merely has the public relations advantage of taking place behind closed doors so the blood doesn’t disturb the grocery-shopping, meat-eating public. For more on the grindadráp controversy, please feel free to read Faroe Islander Elin Brimheim Heinesen’s blog post, Why Most Arguments Against Grindadráp Fail, the official Faroese whaling website, this PBS documentary or information directly from highly regarded conservationist groups. Sea Shepherd is an environmental activist group whose founder, Paul Watson, split off from Greenpeace due to his confrontational tactics. Many people around the world see Sea Shepherd’s members and volunteers as heroes protecting the whales, and they have a large media presence including, in the past, a reality TV show called Whale Wars. Others, however, decry the organization’s disregard for facts and their vigilante actions (they have been called eco-terrorists and faced charges for assault and sabotage, among others). For more on the Sea Shepherd controversy, you can find many news articles about Paul Watson and the organization, such as this one from The Telegraph. The Sea Shepherd Grindstop volunteers started arriving in the Faroes last week, provoking a wide range of reactions from Faroe Islanders. Many wish the protestors would not be allowed into the country. Others say that it is important to treat them with respect as visitors, and that, on the bright side, they will be forced to spend money in the islands. There is also a small group of Faroe Islanders who are themselves against the grindadráp, despite the inherent difficulty of going against the established culture in a small community. A Facebook group called “Faroe Islanders against the Grind” counts 104 members. 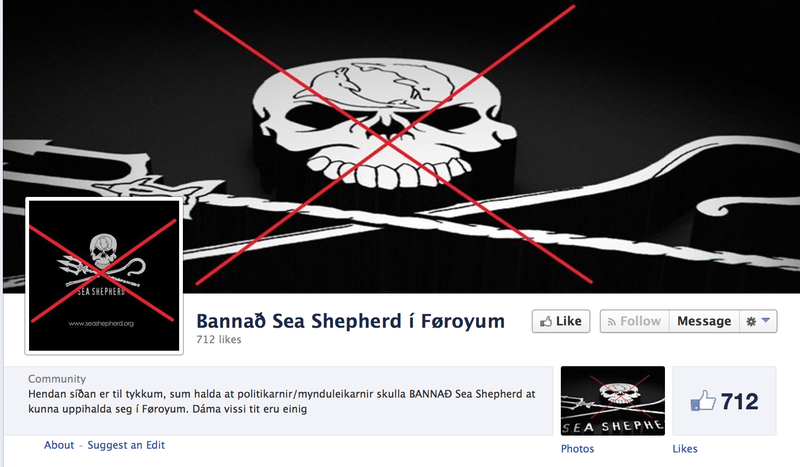 In comparison, another Facebook group was created about three hours ago to call for banning Sea Shepherd from the Faroe Islands. The group currently has 712 members. Whatever the attitude, the presence of such a large group is bound to have an impact on the islands this summer. With fewer than 50,000 people living in the Faroe Islands, 500 protestors can be considered the equivalent of 3 million foreign Muslims, Jews and vegetarians invading the United States to demand that Americans stop slaughtering pigs and consuming pork products. In the first week, not much of note has happened on either side. The Faroese are waging their own anti-SS social media campaign, sharing such critical news stories as photographic evidence of Sea Shepherd volunteers stealing food from a ferry buffet or mocking Sea Shepherd operatives for calling the police when a group of rowdy Faroese came towards one of their boats calling them names one night in the capital. 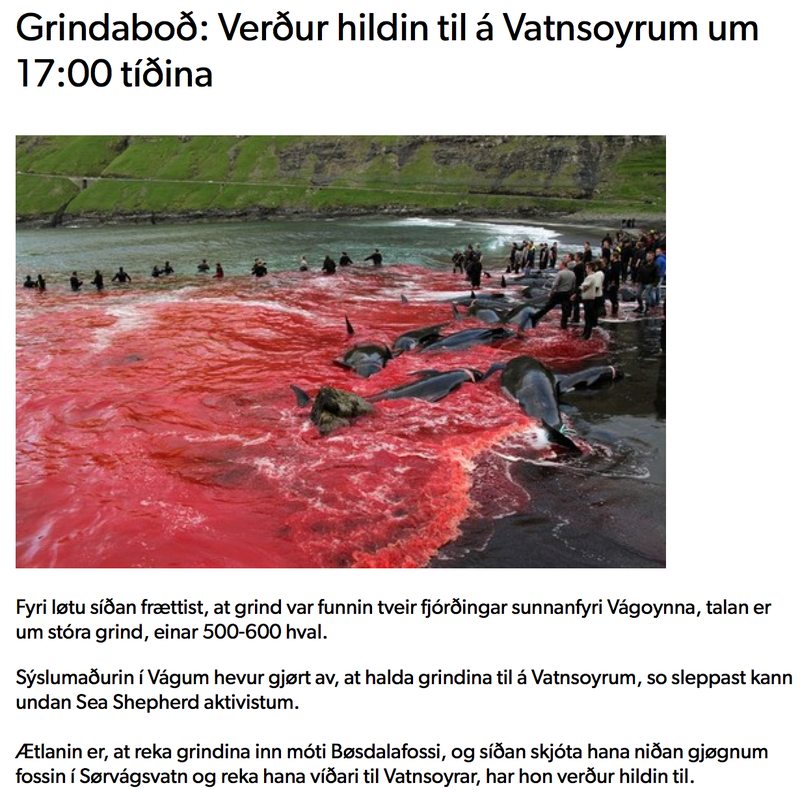 One satirical Faroese website even went to far as to announce a fake grindadráp, which it said would be held at Vatnsoyrar — the only village that is not on the coastline, but rather on the shores of the largest Faroese lake! The explanation was that in order to avoid Sea Shepherd, they would shoot the whales through a waterfall. I don’t know whether any Sea Shepherd people showed up in Vatnsoyrar, but I did find the link posted to their Grindstop Facebook page by concerned readers. Mimmy Vágsheyg, a Faroese woman who opened a new cafe in Klaksvík this year, says that anti-whaling advocates have been harassing her online for months, sending her messages filled with graphic images and leaving phony bad reviews on her business listings. Vágsheyg does not serve whale meat at her cafe, but thinks that the group must be indiscriminately targeting Faroese businesses. “I’m just getting started here, I don’t need this!” she said. 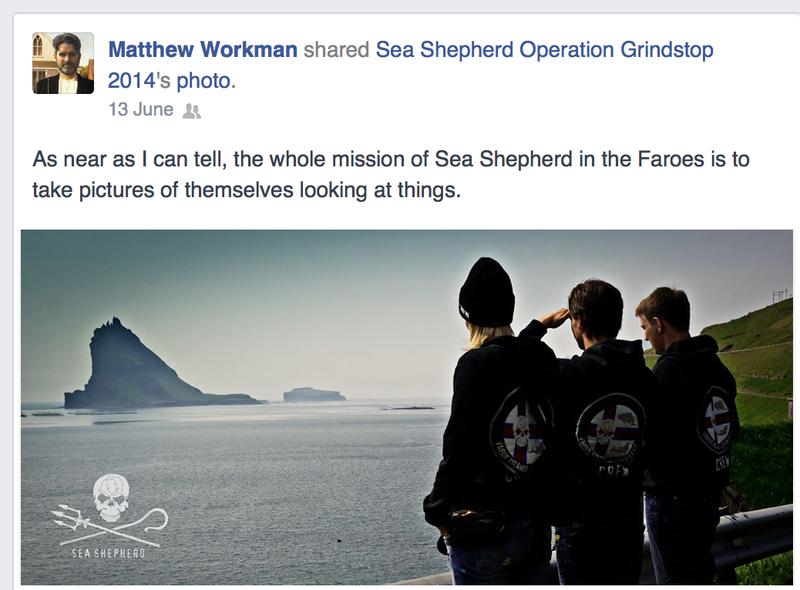 This entry was posted in Faroe Islands, History, Identity, News, Whaling and tagged Controversy, Faroe Islands, Sea Shepherd, Travel, Whaling on June 17, 2014 by Miranda Metheny. I’m not sure I understood everything you have written, but you say that you have never seen the necessity to kill whales. I suppose I would ask whether any food item or cultural practice is necessary, in isolation and per se. There are certainly arguments to be made both for and against the grindadráp, and I have tried to talk to both sides and understand their perspectives. The question is not whether or not the grind is absolutely necessary to the Faroe Islanders today — the answer is no — but whether or not they should continue doing it, and, even more than that, whether people from another country should be telling them they shouldn’t and actively preventing them from doing so (in violation of their own national law!). At least most Sea Shepherd volunteers are vegan/vegetarian, but many of their supporters are not, and come from countries that kill many thousands more animals than the Faroese… so there is often a hypocritical element to it as well. Anyway, thanks again for dropping by! I hope you will continue to read from time to time.